Hey man! I love the idea, thanks for the mention in the description by the way! Just wanted to let you know though, Transguild Courier has a WUBRG colour identity so you can't run it in anything besides 5-colour. Similarly, Painter's Servant is banned in EDH. 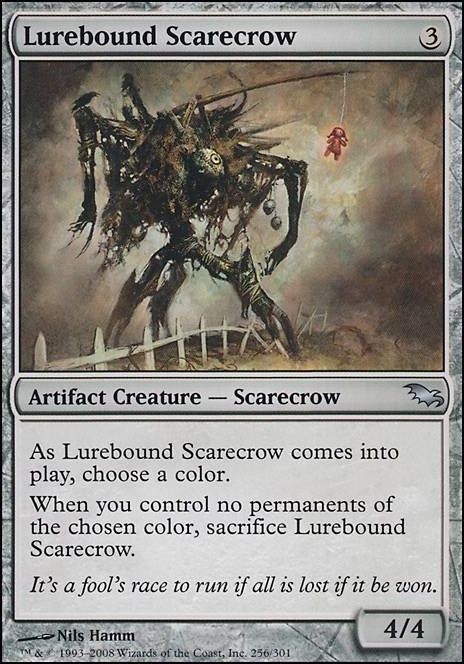 I really like the use of the skulkin cycle to mess with the board state but I feel like Lurebound Scarecrow (despite the obvious flavour win) isn't really worth a slot. It doesn't do anything besides be a 3 mana 4/4 and there are a lot of better 3 mana creatures you can run in EDH. Though I do understand completely if it's a pet card of yours, we all have them! Descendants' Path, if you want to go heavy tribal. Metallic Mimic, for extra buffs at low cost. 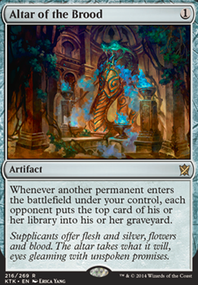 Obelisk of Urd, for more huge buffs. Stoneforge Masterwork, for massive tribal buff. Conspiracy or Xenograft, so every creature triggers the King. Conjurer's Closet, get a Vindicate every turn. Why are you running Unbender Tine over something like Kiora's Follower or Vizier of Tumbling Sands? 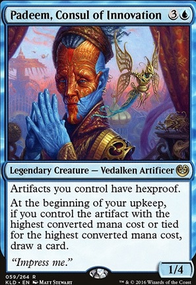 Sidran7e on Advertise your COMMANDER deck! You need more scarecrows bro. I suggest Wicker Warcrawler, Wild-Field Scarecrow, Heap Doll, Grim Poppet, Lockjaw Snapper, Scarecrone, Lurebound Scarecrow, and Painter's Servant just to name a few. 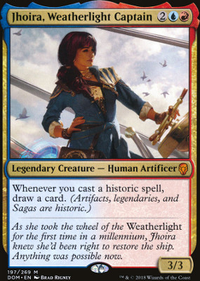 Yeah, the AEther Figment does seem like the best choice, especially with AEther Vial in the deck, keeping it on 2 counters seems like the best play, so now there's another 2-drop you can get with it! Concerning the Door of Destinies, I do think it would be a little slow for the deck, but there's just so much power packed into it, I just had to suggest it. Oh, and speaking of suggesting things, you should add Crystalline Nautilus and Lurebound Scarecrow. They're pretty much just for a 4/4. The problem is that they're not illusions, so they won't be buffed by your tribal cards. Wall of Omens, Adaptive Automaton, Path to Exile, Hall of Triumph, Lingering Souls, Cavern of Souls, Lurebound Scarecrow, and Marsh Flats and a singleton Godless Shrine for deck thinning and flashing Lingering Souls back. Actually, as stated on the "Cards" section, she's "Essential as the Reaper King". This deck does not work without her... well, maybe it may do in a way, but in a really crappy way. Remember that she's not only here to bring back the straw guys, but also for the card drawing, scarecrow sacrifice (which is the same ability, but depending on the situation, one part may matter more than the other). Being a scarecrow, she comboes with the King too, both the vindicate, and +1/+1. Also even with herself if two are on the battlefield. And with every other artifact combo here. So no, please don't remove her. On the other hand, you may want to take the Painter's Servants and Lurebound Scarecrows away, taking some options from the maybeboard. Those are the other scarecrows that are good enough. I find the rest of them to be useless, too situation-dependent, or pure crap. 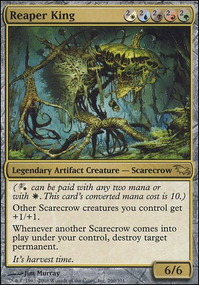 (even though the art is amazing).With those in the Maybeboard, you can try to make a flying army in order to compensate with the lack of strenght: One-Eyed Scarecrow, Pili-Pala, Watchwing Scarecrow, Wingrattle Scarecrow. Thing is, this last two are not good without colored permanents. On the other hand, Lockjaw Snapper is a pretty acceptable scarecrow by himself to consider. Academy Ruins can be easily taken away to reduce budget as well. Also, sorry for the late response, been pretty busy lately, and wanted to explain as exhaustive as possible.